Here’s a tough sell for an American reading audience: a challenging, 700-plus-pager about a very successful English football club manager, based on a true story. About that “challenging” thing—the book is challenging, but not in a footnoted, stories-within-stories, tricky postmodern kind of way. No, this is an endurance test. Bill Shankly, the man this novel is about, is one of the great football managers of all time. (I’m going to refer to football as football here, and not soccer—because that’s how it is in the book, and also “soccer” sounds like something children play.) He took over an ailing Liverpool Football Club in 1959 and over the next 15 years raised the team up from the scummy backwaters of lower-tier English football and turned it into a trophy-winning powerhouse. How did he do it? Repetition, repetition, repetition. In life, in training, in everything. This becomes painfully apparent very early on in the novel, as Peace sets up the narrative and stylistic scaffolding. Short sentences. Repetitive sentences. A wholesale chucking of even the faintest notion of elegant prose. Indeed, this book is made of a forest’s worth of wooden sentences. Seasons are methodically recapped match by match in choppy bursts: “In the third minute, Ian St. John scored. In the fifty-fifth minute, Roger Hunt scored. In the sixty-fifth minute, Alan A’Court scored. And four minutes later Hunt scored again. And Liverpool Football Club beat Manchester City four-one.” Here’s a blip from another random page: “Bill dried his hands. Bill picked up the tea towel. Bill dried up the pans. Bill dried up the plates. Bill dried up the knives and forks. Bill put the pans in one cupboard. Bill put the plates in another.” (This goes on for a while, and is not the only time Bill does the dishes.) At several points I nearly put the book down, having plowed through another 100 pages that were more or less the same as the 100 pages that had preceded them. But I didn’t. Because Peace every now and again figures out a way to smuggle in a bit of actual human emotion—and having finished the book, I can’t figure out how he managed that. At one point, Liverpool is once again dumped out of Europe, and I felt crushed. Another season, Liverpool misses out on the league title, and I was legitimately bummed for Bill. I have a lot of gripes about the book. Bill is too much a saint; after he retires, the book becomes a series of situations for Bill to stumble into and act selflessly. His wife is a one-dimensional phantom of ceaseless nicety. Massive chunks of the narrative could be lopped off (a 20-plus-page reproduction of a radio interview springs immediately to mind). Pretty much everyone has the same stilted speech pattern. But for all of the book’s faults, it’s hard not to admire its hubris. 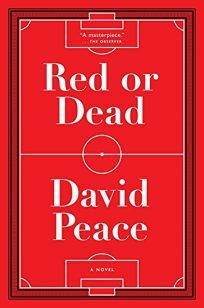 There is nothing else at all like it out there, and there are some nerdy delights to be found in reading this if you’ve also read Peace’s other football novel, The Damned Utd, about another famous football manager, Brian Clough. But if ever there were a case where you love the idea of something much more than the actual something, then this is it. Jonathan Segura is the executive editor of Publishers Weekly. His writing has appeared in GQ, NPR, and The Best American Sports Writing 2013 (HMH).